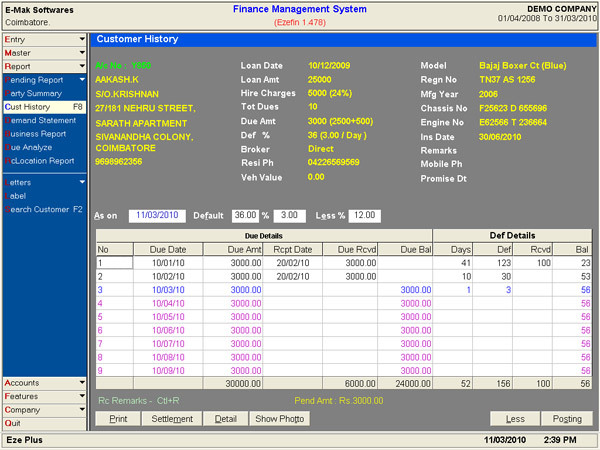 EzeFin is a complete automation solution for Hire Purchase, Auto Finance Company. Application has been specially designed to cater to the technological needs of the auto loan banking and vehicle loan financial services industry. Hire Purchase and Finance Companies require more features and functionality from a software package than ever before. 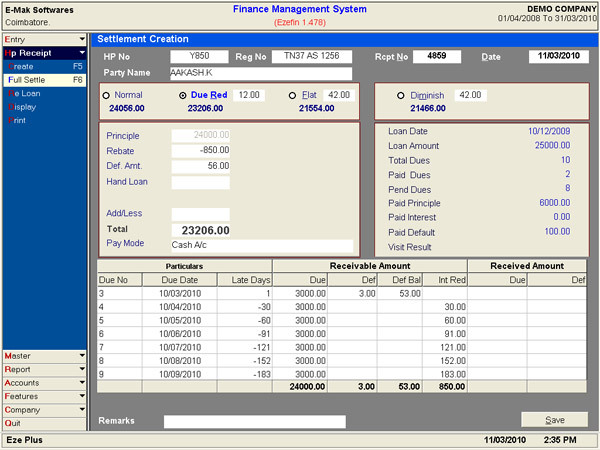 The newest Windows™ based auto loan application, the EzeFin Series of software for Auto Finance Companies, has been developed using the latest in technologies and greatly expands on the functionality of previous versions. Emak has recognized the need for a comprehensive series of systems in the market that are reliable, easy to use and relevant to the hire purchase industry. The EzeFin Series is comprised of a base system and key functional areas that offer a wide number of different Hp, Loan and Deposit types. These may be enhanced by a number of optional add-ons that need only be purchased if required. This allows for changing requirements and system growth that can match that of your finance company.Emak's Auto Hire Purchase Finance Management functionality is user-friendly, quick and powerful in both its functionality and reporting. Integrated Accounting with Finance Management is an important factor in strengthening any finance business. With multi level grouping of accounts and built in automatic ledger posting simplifies the whole process. For example when you do new Hp entry creation, system will do a payment entry for you, automatically.With Emak - EzeFin you will get tools to analyze and improve your Profitability. Full information is kept on every Loan giving you easy access on all enquiries. Information includes Client and Guarantors, as well as financial details, current status, payment schedule, letters, transactions, photo of the client and notes. EzeFin can produce Overdue Letters for early detection and actioning of arrears. Letters ranging from mild reminders through to pre-possession and repossession authorities can be generated. Agreement Forms, Endorsement letters, Endorsement cancel letters can also be created. Comprehensive, flexible and user-friendly reports, export to excel and PDF format also. Easily track your customer information in one place. Speed up your HP Loan creation; automatic and instantaneous calculation of interest and payment schedule. Store and easily access complete details of the customer and the loan including vehicle details, photos, payment history, addresses, phone numbers and landmarks of borrower. 2nd year Insurance, RTO Expenses can be treated as Hand Loans and will appear automatically in reports and receipts. 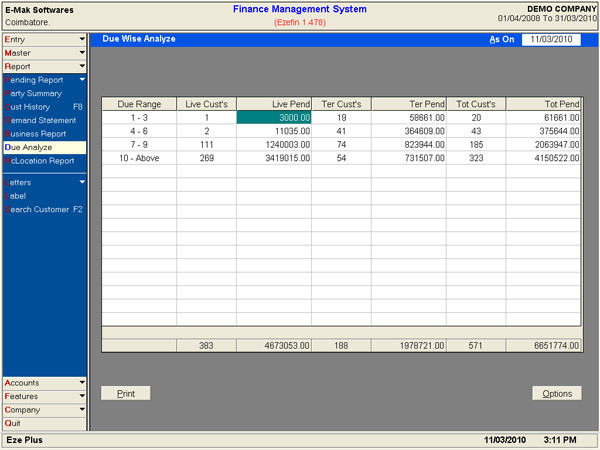 No more manual calculation, EzeFin displays detailed calculations for both due amount and default amounts with break up. 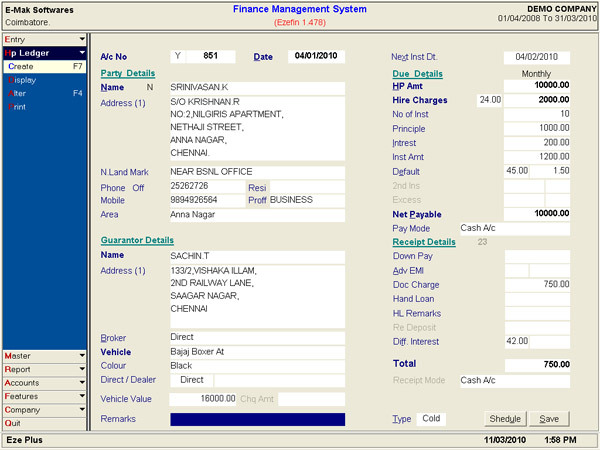 Instantly view the customer's loan details (including vehicle details), also view party's loans and payment history. Part payment handling facility available. EzeFin makes loan foreclosure simple; it automatically calculates the remaining dues using Normal, Due Reduction, Flat and Diminishing modes, allowing you to choose the most beneficial option. Party History is always accessible, anywhere in the program with a single click. ex: loan receipt creation, foreclosure and pending reports. It provides useful information like borrower and vehicle details, detailed payment history including hand loans. Comprehensive Pending Report facilities helps to simplify your collection process; by filtering the Due, Month, Area, Make, Dealer and by viewing the order of Duewise, Areawise, Dealerwise. EzeFin generates reports for Insurance Expiry, Promise Expiry, Tax Expiry and all kinds of letters required. Demand vs.Collection and Business Status Reports helps to track your collection and business performance. EzeFin comes with integrated accounts management that includes Daybook, Trial balance, Profit and Loss Statement and Balance sheet. It avoids the need of separate accounting software or separate entry for accounts posting. It generates periodic statements showing financial position of a firm/company for a specific period, resulting from its business transactions and operations. Emak Software, EzeFin, Auto Finance Software, Auto Loan Application, Finance Accounting Software,Leading Finance Software Developers in India, Accounting Solution for Finance, Auto Dealer Loan Management, Auto Work Shop, Petrol bunk Management, Software For Loan Management, Due Calculator, Loan Calculator,Coimbatore,Download Finance Software, Finance Software Solution, Vehicle Loan Management, Hire Purchase Software, Hire purchase Finance Management, auto loan software, auto finance software, hire purchase accounting, hire purchase finance software, hire purchase and installment system,loan management software, loan management program, loan manager software, Auto Workshop Management, Kovai, Software Development, Accounts Management, finance software, finance management software, finance business management, finance company software, business finance software,business finance management,software for finance,software for hire purchase finance,software for auto finance, software for loan accounting,software for loan processing, best software for finance business, best finance management software,best finance software,best financial software. ©2011. Rights reserved by Emak Software.